Lets start with the basics. Reflectivity was not invented. It has always been present in nature. Light bouncing off of objects is why we are able to see those objects. Retro-Reflectivity has also always been present in nature. A cats eye is an example of this phenomenon. (parabolic lens creates a retro reflective surface) So retro reflectivity was discovered, not invented. What was invented was an artificial way to reproduce these characteristics in a usable form. There have been two breakthroughs in the technology of retro-reflectivity. The first is the perfectly spherical glass bead and the second is the man made prism. Both of these discoveries play a big part in the history of reflective surfaces and tape. Lets start with the glass bead. Potters, an American company, began producing tiny glass beads or spheres in the early 1930’s. The beads that Potters created were very round or spherical which was important. Only a perfectly round and clear bead would send light back to where it came from. These very small and very round glass beads were used on cinema screens to make them brighter and also on road stripes to make them more reflective. To this day glass beads made by Potters are still used on road stripes. The paint is applied and while still wet the beads are sprinkled on top. That is why at night the painted lines show up so well. This is all because the round beads sit up from the paint surface just a little, take in light from your headlight, and bounce it right back to you. Sort of like a parabolic mirror. At first, glass beads were applied to the surface of signs and left exposed. The reflectivity achieved was low and in rain it was even lower. Also, over time, dirt would build up between the beads and further limit visibility. This experimentation was a start, but further improvements were needed. In 1937, 3m began developing a film that utilized glass beads bonded to a flexible surface. Their intention was to use this tape on road surfaces but after some durability issues they switched their focus to road signs. To create a brighter tape, 3m created a base layer or film that was a silver color like what is on the back of a mirror. They then applied glass beads to this surface so that about half the bead was embedded in the silver and half was exposed. The silver backing turned the back of the bead into a mirror and the shape of the bead provided for the return of light back to the source. To protect the reflecting beads, a clear layer was applied. This resulted in a much brighter product. The clear layer kept the beads protected and made the tape visible even when it rained. (Note – by tinting the top coat, different colors were created) In 1939, 3m introduced what was known then and today as “engineer grade” reflective sheeting. It was first used in trials in Minneapolis and then in the UK. Later, improvements in engineer grade tape would be made by using advanced mirroring techniques and higher index beads. Also, variations in the top layer allowed some versions to stretch and conform and others to be stiffer. The type that conforms is used for vehicle applications, traffic cones, and road barrels, while the type that is more rigid is used for signs. 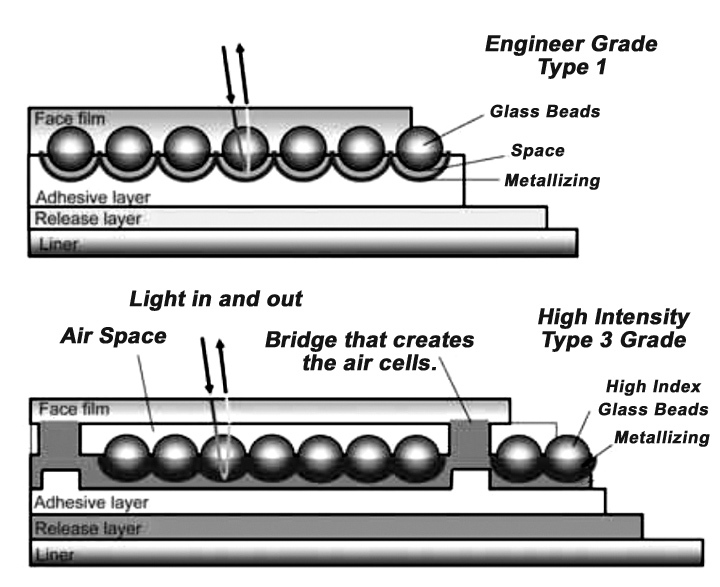 Engineer grade is also known as an enclosed bead sheeting. This simply means that the beads are immersed in the top coat so that each bead is sealed and protected. There are pros and cons to this type of construction. On the plus side, you can cut the tape and make letters or shapes and the integrity of the glass beads are unharmed. It is for this reason that engineer grade tape is so popular in the graphics industry for letters, shapes and designs cut in the material. On the negative side, this type of construction reduces the overall reflectivity of the beads. Engineer grade or type 1 film reflects at a rate of about 75 candelas for white and less for the colored films. The same as your car tag. For applications within 100-150 feet, this is more than sufficient. In 1971, 3m introduced their “high intensity” reflective sheeting. This tape or sheeting is different from engineer grade in that the beads are enclosed in cells but not completely encapsulated. They sit in a honeycomb type hexagon cell and are sealed in by a clear or colored top coat. Also, instead of sitting in a metalized layer, the actual beads themselves are metalized. Being metalized themselves and not being encapsulated makes the beads much more reflective. In fact, high intensity sheeting is about three times more reflective than engineer grade sheeting. High intensity sheeting is very popular for sign backgrounds. Since cutting the tape opens up the cells and allows water to intrude it is not often used for letters or shapes. (NOTE- only the cells that are cut are affected. All other cells remain sealed. Plus the cells are very small) High intensity or type 3 sheeting represents the brightest tape that can be created using glass bead technology. Roughly 250 candelas for white. High intensity sheeting was and is used extensively in sign making. Since signs are static the material performs well. And the extra reflectivity allows vehicles to see it much farther away. In the 1970’s several companies also entered the glass bead reflective tape market. Avery Products launched a line of engineer grade reflective tape in the United States. Avery merged with Dennison and became Avery-Dennison in 1990. Seibu International, a Japanese company, launched a similar line overseas. Their sheeting was known as Seibulite. In 1991 Seibu was purchased by Nippon Carbide (also a Japanese company) and the product was renamed Nikkalite. Prismatic sheeting reflects light back to the source just like glass bead tape does. The only difference is that prismatic retro reflective sheeting does this much more efficiently. Instead of light entering a glass sphere it enters a triangular prism. Micro prisms have straight sides that allow more light to enter and exit the prism. Prismatic tapes are about 80% efficient while glass bead tapes are about 30% efficient. Also, prisms are man made and are placed side by side in a tight array while glass beads will have some dead space between the beads. Just like glass bead tape the microprisms are also mirrored on the back. The front of the prism allows light in and the back reflects it and sends it back out. 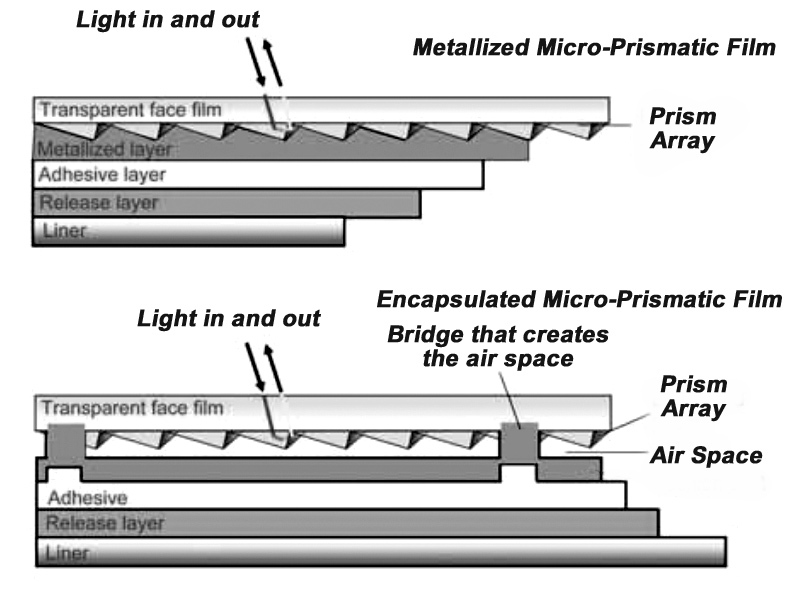 Like glass bead tapes, micro-prismatic or cubed cornered tape comes in two types, metalized micro-prismatic and encapsulated lens. Metalized film is popular in the graphics industry because it is made in one thin layer and will not delaminate. It has the same positive features that engineer grade has but is 10 times brighter. Encapsulated or non metalized prismatics are thicker and are more prone to delamination. However, the colors are a little more vivid due to the absense of the silver mirror coating. Because of this, for sign sheeting, non metalized films are preferred. In the 1980’s Stimsonite, a major manufacturer of road reflectors launched their own prismatic sheeting. They were subsequently purchased in 1999 by Avery-Dennison who was then able to add Stimsonite micro-prismatic sheeting to their glass bead line. Nippon Carbide, the company that acquired Seibu, developed their own line of micro-prismatic films and were then able to offer a full line of reflective products from engineer grade glass bead tape to prismatic sheeting. In 1989 3m launched a prismatic product known as diamond grade sheeting thus completing their line of reflective sheeting products. In 2012, Reflexite Americas merged with Orafol. Orafol is a German company and has an impressive global presence. Before the merger, Orafol had a large line of reflective films. (mostly glass bead technology) This line more than doubled with the addition of the Reflexite prismatic reflective products. At the present time, there are four major competitors in the reflective tape business. These are 3m, Orafol/Reflexite, Avery Dennison and Nikkalite. All four companies have a glass bead and prismatic line. 3m is actually the least competitive in the glass bead market now. Their strategy has been to focus on prismatic tapes and slowly discontinue the glass bead line. Whether this is a good move on their part is yet to be seen. Previous PostDefinition of Retro Reflective TapeNext PostReflective Versus Retro Reflective Tape – What is the Difference?